On Sunday, January 20th, 2019, there was Solemn Ordination Mass at the Cathedral of Our Lady and Saint Basil in Toronto, Canada. The chief consecrator was Metropolitan Archbishop Glentis G. Samuel, Ordinary of Metropolitan Archdiocese of Our Lady and Saint Basil of The Anglocatholic Church (Canada). Also was present The Most Reverend Dr. David Smith, Patriarch Coadjutor of The Anglocatholic Church. Two priests were ordained – The Reverend Fr. Terrence Richards and The Reverend Fr. Dr. Glenn Reid and one one deacon was ordained – The Reverend Deacon Adli Juvaidah. 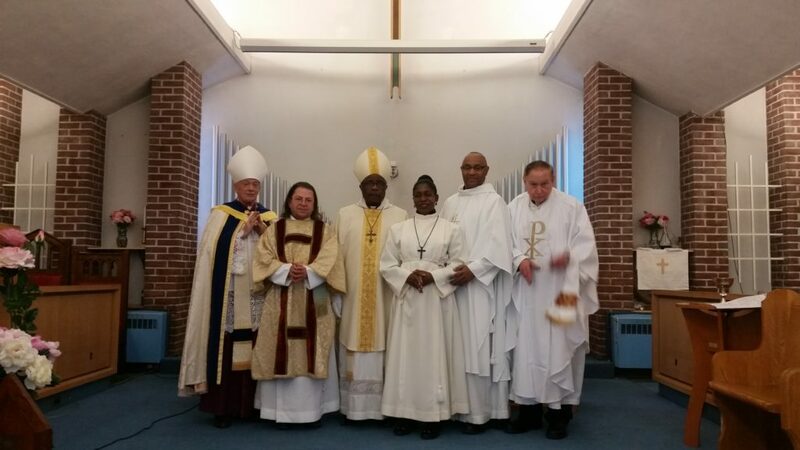 On the photo from left: Patriarch Coadjutor Dr. David Smith; The Reverend Deacon Adli Juvaidah; Metropolitan Archbishop Glentis G. Samuel; Claudette Sylvester – Acolyte and Sacristan; The Reverend Father Terrence Richards; The Reverend Father Dr. Glenn Reid.